For my 2013 goal, I needed a beer in the BJCP Category 4 (Dark Lager). 4C. Schwarzbier (Black Beer) seemed like the obvious choice. It is a flavorful, dark, clean tasting lager with a fair amount of hop flavor and enough hop bitterness to balance out the malty sweetness. Think German Pilsner ... only Black. Seems like a wonderful beer style for me. The name "Khazad-dûm" refers to the abandoned Dwarfish Kingdom of Moria through which the Fellowship of the Ring had to travel on their quest. By the time Frodo and his companions went through, Khazad-dûm was overrun by orcs and other creatures of the dark. It was a dark, black place. The trip through Moria was one of the most exciting entertaining parts of the Lord of the Rings trillogy and the name of my beer is a tribute to adventure. 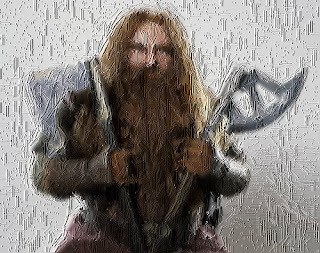 I also think that if Gimli was into craft beer, he would have chosen a black lager as his go-to beer. Khazad-dûm Black Lager was my second in the series of German lagers using Bohemian Lager (Wyeast Labs #2124). By the time I brewed it, I had brewed Snowball's Chance (in) Helles and harvested its yeast. When Khazad-dûm was done, I harvested its yeast and used it in a Mailbock. I developed my recipe toward the dark side of the style, using 8% Carafa III (over 500 srm). The base malt is simply a German pilsner and I added in almost 10% Munich malt for more flavor. I am balancing the malt sweetness with 25 or 26 IBU, making my BU:GU ratio right at about 50%. I am adding quite a bit of Hallertaur, Crystal, and Tettnang hops towards the end of the boil, giving this beer a little more hop flavor than your typical Schwarzbier. With its relatively low alcohol (under 5.5ABV) and flavorful balance this made a great session beer. I thought this beer turned out awesome. 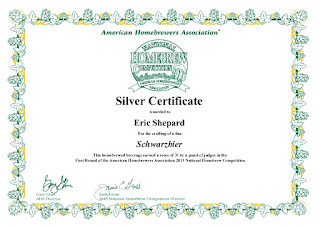 I entered it into the 2013 National Homebrew Competition, and although it did not place, it did "win" a Silver Certificate. Use harvested yeast from Snowball's Chance in Helles. Add the Carafa III in for the last 15 minutes of the mash. Keg. Save the yeast to use in another batch of beer. Bought ingredients today. Bin of German pils was low so I swapped in an extra pound of Munich. Here it is day 3 of fermentation and it is the first day that I have had to change out the water bottles. Temps in both fermentors are still less than 55. Fermentation seems to be slowing down. Temps in the 52 / 54 range. It has been a week (almost) so I am going to let the temperature rise into the 60s. Put into secondary. Gravity at 1.012. Sample tastes absolutely fantastic. Harvested yeast. Kegged this and filled 13 12oz bottles, 2 bombers, and 1 liter pet bottle. Carbed with 4.75oz sugar, which should be 2.7 volumes. Hopefully I don't have a repeat of the Snowball low carb disaster. Sample was black with beautiful ruby highlights. Very clear. Nice amount of roast without being overpowering. FG still at 1.012. Tried one bottle last night. Real low carbonation. Not as bad as Snowball's Chance, but not what I am used to at all. What is my problem? Am I just too used to kegging now? FTH? I guess I'll add priming sugar to these bottles like I am doing with Snowball's. I love this beer from the keg. There is a bit more roast flavor than I thought it would have and less hop flavor, but it is smooth and extremely refreshing. Very drinkable. A nice sessional drink. Killed the keg last night. Sad. Hopefully most of those bottles are carbed ok.
Had a bottled tonight. Great. Had a bottle. Still very good. Nice and smooth. Had the last (I think) bottle. Still good.